Preparations are in place in case of further flooding in the north west, the Department of Infrastructure has said. Flood-hit areas are bracing themselves for more heavy rain. The Met Office has issued a yellow weather warning for the rest of Friday. Roads and bridges crumbled, cars were washed away and homes and businesses were destroyed in storms on Tuesday night and Wednesday morning. The department said 8,000 sandbags have been given out since Tuesday. However, there has been growing anger in the north west among those hit by this week's flooding. Some householders have said the help being offered goes nowhere near meeting the costs of fixing the damage caused by the floodwater. Image caption Chris Craig said that a £1,000 payment would be a "penny in the ocean"
Others say they cannot begin to clean up until private insurers carry out inspections. They have been told staff have to travel from England. Chris Craig said his family home in Eglinton had been devastated. "The damage to the floors, all the wooden floors, the surface floors and then the sub floors down below are completely destroyed," he said. "There's a £1,000 grant being handed out and it'll be like a penny in the ocean, because all the sub floors need to come out as well, the plywood floors all need to come out, the whole thing, kitchens and all are gutted completely." A few doors down, the Barr family are still waiting for insurance assessors so they can begin the clear-up. "My home was destroyed, my whole downstairs, I've lost everything," Veronica Barr said. Her 81-year-old father-in-law had to be taken away from the house on a boat during the flooding. Derry City and Strabane District Council has dealt with about 500 people who have asked for help under the emergency payment scheme and about 300 properties have been inspected. "It's been a challenging exercise but all the statutory agencies have come together," the council's Stephen Gillespie said. "Everyone's need is different and the picture keeps changing and, as that need changes, we're trying to adapt out support for each of those people." More than 100 people were rescued from cars and houses in Donegal, Tyrone and Derry after 63% of August's average rainfall fell within nine hours earlier this week. The Met Office has warned that "given the recent wet conditions, there is the possibility of localised flooding of homes and businesses as well as susceptible roads". The Irish weather service Met Éireann has also issued a yellow weather warning for County Donegal until 18:00 local time, with "further spells of heavy rain expected". Taoiseach (Irish prime minister) Leo Varadkar visited affected areas of the county on Friday afternoon. Soldiers from the Irish army were deployed on Friday to help with the clean-up operation. Thirty soldiers co-ordinated the effort with Donegal County Council officials in Inishowen, where the scale of the disaster was described as "unprecedented and catastrophic". The Northern Ireland Housing Executive (NIHE) said 26 of its properties in the Londonderry area were badly damaged. Twenty families have been rehoused in emergency accommodation. Eddie Doherty, from the NIHE, said the people who had been rehoused were a mix of vulnerable people, young people and older people. He said the NIHE had appealed to private landlords and estate agents to make vacant houses available to them. The Department for Infrastructure said about 25 of the roads that were closed due to flooding have now been reopened and all affected main traffic routes are now passable with care. 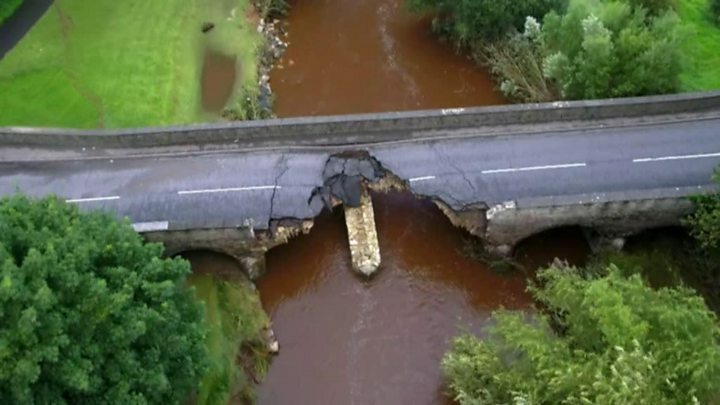 The roads still closed are mainly due to collapsed bridges or culverts, land slides, damaged road surfaces or debris washed on to the road and are mainly in the Claudy, Drumahoe, Gortin and Greencastle areas. "Work is continuing over the bank holiday weekend to assess and repair damage to the roads and rivers impacted by this flooding," a spokesperson said. Rosemary Wright, who owns a damaged business in Eglinton, said she was "devastated". "If I have £100,000 it wouldn't cover the damage," she said. "The whole of reception needs to be gutted and dug out. It's horrendous." On Wednesday politicians queried preparations ahead of the weather warnings. The Department for Infrastructure said it would investigate any problems with the NI Direct floodline, after many callers complained they could not get through during the crisis. Owen McGivern, head of Department for Infrastructure Rivers operations, said there were questions to be answered and the flood line's performance would be reviewed. An emergency payment has been made available to flood victims, which will provide affected householders with up to £1,000 for refurbishments, following inspections by council officials. But the SDLP say the scheme should be extended to include non-domestic properties like businesses, community and sporting organisations.